Family companies in any country can be categorized based on the stage of family and ownership. An analysis of family business system development in 1997 led Gersick, et al to create the Three Stages of Development of the Family Business, first published in the book Generation to Generation: Life Cycles of the Family Business . This framework illustrates the typical categories and path that a family company moves along over time. It provides a way to understand the strengths and challenges of family companies at each stage so we can be more prescriptive about how families can prepare for the future. Most family businesses start at the Controlling Owner stage with one owner (or one owner and his/her spouse) having ownership control. A family business can stay at the Controlling Owner stage for many generations if ownership remains consolidated in one person or a married couple. At this stage, the family is typically small, and family relationships can be intense. The business is almost always in the center of the family’s life. The founder is impressive, builds a lot of value and is typically at the center of activity, often regarded as indispensable. Because families tend to pass ownership equally to the next generation, family businesses typically move next to the Sibling Partnership stage. Now brothers and sisters control the business together through ownership. Families at this stage are larger and more diverse, and businesses are larger and more complex, typically. The company relies on a sibling team to work together effectively. Family relationships can be less connected as siblings create their own nuclear families. Sibling tension around power and fairness, balancing dividends with reinvestment, and building professional systems in the business are common issues at this stage. 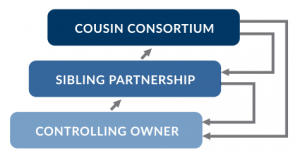 Next, family companies typically move to the Cousin Consortium stage as ownership control passes to a group of cousins. The family is larger, more diverse, and the business is larger and more complex. Typically few family members are employed in the business at this stage. Non-family members often manage the business while the family gravitates to board roles. With a large family, maintaining unity and organization in the family is critical. In addition cousin families often face the issues of accepting branch differences, managing the psychological impact of wealth on families, maintaining aggressive reinvestment in the business, and redefining the family mission for a large family. Because we know the typical path of family businesses, we can identify the common challenges and critical tasks for families to address at each stage. Getting in front of these issues and addressing them early reduces tension in the future and makes room for greater prosperity. Read more about the Stages of Development of the Family Business in Generation to Generation: Life Cycles of the Family Business .